BAND-MAID - USA Concert Debut + "alone" MV | VKH Press – J-Rock & Visual Kei Coverage Worldwide! All-girl rock band BAND-MAID is making their debut US performance, March 2016! Sakura Con 2016 will run March 25-27 at the Washington State Convention Center, and as musical guests for the event BAND-MAID will perform a live concert, participate in a Q&A event and hold an autograph session. Complete information about attendance and registration is available at Sakura-Con's website! Pre-registration is still available at this time, but it's closing on March 1st! BAND-MAID has been picking up popularity quickly, and is scheduled for several notable upcoming appearances. On March 14th, Japanese music television program J-Melo will air an interview with the band, named as one of the finalists in the program's Breakthrough Artist Showcase. Then, on March 19th, BAND-MAID will be guests in rock band exist†trace's "Attack to Nagoya - My Existence" live show. 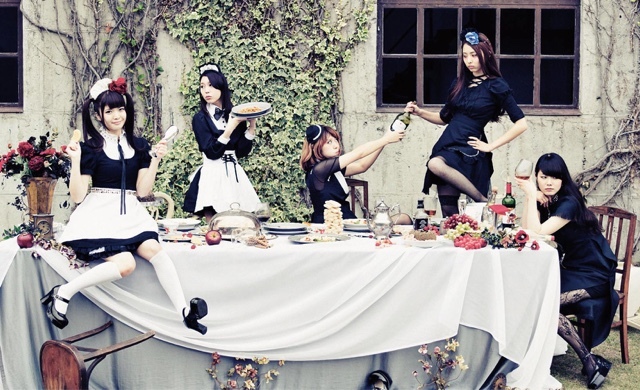 The song alone was BAND-MAID's most recent music video release, and was uploaded to YouTube on Valentine's Day, gaining over 10,000 views within its first twenty four hours online. Enjoy the video, shown below, and make it to see their US debut at Sakura Con if you possibly can!